Lately things have been VERY BUSY around the Chenoweth household. Due to Sell a Bration season I've had a lot of events to hold which have kept me super busy! But its time to settle down, take a deep breath, and coast for a few days! I do have one more workshop before Sell-A-Bration is over, but I'm ready for it, and can't wait! Last night I held a "Carte Postal" class and it was a ton of fun! We made four cards and then decorated a tin from Maya Road. Very cute! We used the Enchante paper and Carte Postal Stamp set and the Flirty ribbon set - all from the Winter Mini Catalog. Keep an eye out, I'll be uploading pictures of cards and other things I've been working on soon! I have to say that if you are ever in my neck of the woods and have the opportunity to attend the New Covenant Academy's mega-crop do it! Today I dropped my darling boy off at 6:30 am and headed into Springfield to get ready. The door opened to croppers at 9 and I was SWAMPED for hours! My make and takes filled up and I had people putting their names on the back of the sign up sheet just in case some one didn't show up during their designated time! I made a bunch of contacts - I've not counted them all - which in itself has made the event worthwhile! I was also able to reconnect with some very talented women and to meet some new ones! I have to say that everyone I met today were the kindest group of women I've ever had the pleasure to come in contact with! In addition to all the new friendships I've also managed to secure 7 bookings! I am completely excited about that of course! Yay me! And added people to my current class rosters! I'm completely worn out now, but I'll try and post more tomorrow with pictures and links to the web pages and blogs of all the talented ladies I got to spend time with today! Good night and happy scrapping! PS - the next megacrop is scheduled for October 6, 2007 and will have the theme of "spring in Paris!" I'll be there - will you?! What madness! The Red Hot Crop is only two days away and I am NEARLY READY! This last week my living room and dining rooms have been turned into Stampin' Up! Heaven! I've got the table covered with current projects I'm finishing up. There's a small table in front of the TV with my forms and fliers and hostess packets and other things that I needed to go through. The counter is set up with my card display boards so I can fill in where I need to. And there's a humun-go rubbermade chest in the middle of the floor where I've been storing things as I think of them! So beyond the chaos that is my house... I thought I'd share my Make & Take for the event. Isn't it cute? 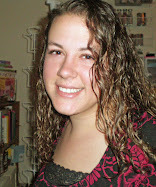 (Gwen Mangelson took all the pics for me! Cause it's kinda hard only having two hands!!) 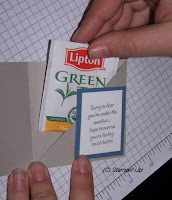 It is a Tea Bag Holder card, and just as easy as can be to make! Buckaroo Blue Cardstock 2-1/4"x2-1/4"; 2-1/4"x1-3/4"
Whisper White Cardstock 2"x2"; 2"x1-1/2"
Sentimental Journey Patterned Paper 3" x 3"
1. 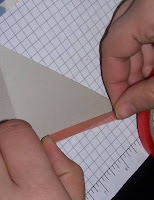 Cut cardstock and patterned paper to sizes indicated above. 3. Stamp Bowl image in Basic Black ink onto the 2x2 Whisper White cardstock. 4. 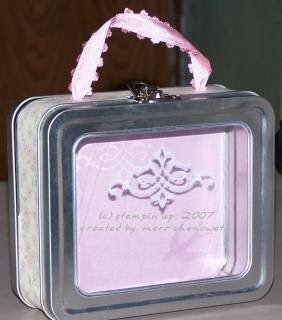 Ink the steam stamp in True Thyme ink, stamp off on scratch paper, then stamp above bowl image. 5. Pick up some Mellow Moss ink with the blender pen, and color in bowl image. 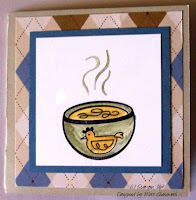 Use the same technique to color in soup and chicken on bowl. 6. Mount this square onto the Buckaroo Blue cardstock, and then again on the patterned paper. Set aside. 8. Run a line of sticky strip along the bottom edge of the last pannel, remove backing, and fold over to make a pocket. 9. Adhere matted bowl image to the front of the card. 10. Open card and adhere sentiment. 11. Insert Tea Bag in pocket and you're done! Hope you enjoyed the project! Have fun!